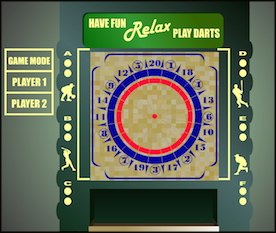 Darts is a game that lends itself to tournament play. We run double-elimination tournaments where teams can play in a "winners bracket" until they suffer a loss. They are then transported to a "loser's bracket" where they continue to play until they suffer a second loss, or win the tournament. On this page you'll find links to a full set of double-elimination tournament brackets that cover 5 to 12 team events. If you have found this page on Tournament Brackets helpful, please consider sharing it with others.